The Resistance! : They take a naked picture of you before you can board a plane. They take a naked picture of you before you can board a plane. 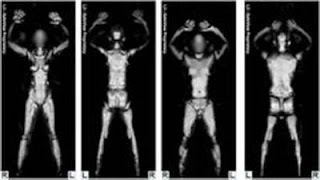 Transportation Security Administration (TSA) undated handout image shows a composite of 4 separate scans, a female in the left two and a male in the right two, from a whole body scan machine, or millimeter wave machine being used at a security check point at the Salt Lake International Airport in Salt Lake City, Utah. NOTICE THEY BLURED OUT THE FACE FOR THIS RELEASE BUT WOULDN'T IN THE AIRPORT. SO ARE YOU OK WITH THE TSA TAKING A NAKED PICTURE OF YOU BEFORE YOU BOARD A PLANE AND STORING IT ON FILE?